One of Brian’s coworkers took photos of our cake table and mentioned them tonight, so of course I asked her to send them my way since I didn’t take a single one! There were two other settings of cupcakes, but this gives you an idea of it. She took the photos as we blew out Matthew’s candle. That was so fun! Categories: Birthday, Matthew | Permalink. Overall – my older sister gets priority. If my parents had had to pick one kid to save in a fire – they would have both run to her room, leaving my little sister and me to fend for ourselves. My little sister and I would have saved each other, and all of the pets, and we would have all lived happily every after. HA! What I hadn’t come to realize, however, is that there is a “pecking order” with the grand kids as well. My little sister had warned me about this, and I think in the back of my mind, I always knew it was going to be the case – but I was just hoping it wouldn’t be. What is different, though, is that the “pecking order” with the grand kids defaults back to what it was for us – so it’s not nearly as personal as it is for us kids. My older sister’s kids get oodles of my parents’ time because they’re my older sister’s kids. It’s that simple. Again – I have to accept it. What I have thought through, though, and accepted is that I do not need to expose my children to this. My younger sister and I had to deal with this while we were growing up because we were under our parents’ roof – there was no place to go if we said, “hey, this isn’t right, we’re out of here.” Sure, we had each other, but selling lemonade or home-made dog treats (my little sister’s business that actually did quite well!) wasn’t going to pay the bills. So we had to stick it out and just roll with it. You know, I shouldn’t be surprised that we’re doing this Etsy business together. My little sister and I have always had each others’ backs (please excuse my bangs, dear God! This is from 2006.)! What is so liberating to me is that our children do not need to roll with it. It is my job, as the parent of my children, to tell my parents, “hey, this isn’t right, we’re out of here.” It’s a hard thing to say because as much as I’ve grown up over the last several years – I still fear my parents dad in a way. Isn’t that weird? I think that’s weird! When my dad does or says something mean-spirited and nasty, it takes everything in me to tell him not to treat me that way. (I come from a long line of passionate, over-sharing, aggressive people. You may be startled to read that my dad says mean-spirited things, but honestly, we’re used to it and once dealt with, it just rolls off our backs.) Confronting my parents is HARD. I am a “pleaser” and rocking the boat is not my favorite thing to do – but I will do it if my husband, my child, or I am being treated with disrespect. What always surprises me about myself is that when drama goes down in B’s family, I say things like, “you just need to call her and say this, that, and the other.” I say it as though it would be so easy for me to do that myself with my own family. I will eventually do that with my own family when needed, but not without lots of planning, prepping, stressing, crying, and phone calls with my sisters first. HA! What is the point of this post? I really don’t know. What I do know is that both B and I have had to deal with our families’ “pecking orders” in the last 4 days. It started with his family, then continued with my own late last night. Totally unrelated. Neither situation is resolved. I am completely unsettled by both, to say the very least. I think I started tackling the one with my dad today because I’ve spent several days telling B and my friends that I don’t let my family treat us poorly and that I try to deal with things head-on when they happen. Then something happened last night with my dad and I figured I better eat my own dog food. There are so many things I want to say to both sides of the family, but as I have told B, I don’t have a “dog in (his family’s) fight.” And in my family’s situation – I am just plain scared. I don’t want to upset my dad because at the end of the day, no matter how poorly my dad treated me, I don’t want to cause a war over something that is never going to change. Will our own little family have a “pecking order?” Oh God, I hope not. But you know, the truth is, it probably will. What I hope, though, is that if there is one, that we will realize it very early and do everything we can to remedy it. I mean – we know first hand what it’s like to NOT be at the top of the “pecking order.” We know how awful it can feel to be the ones who always have to make concessions to accommodate one or more of our siblings. Hopefully, HOPEFULLY, B and I can learn from this and treat our children with the love, equality, and respect that they deserve, throughout their entire lives with us. 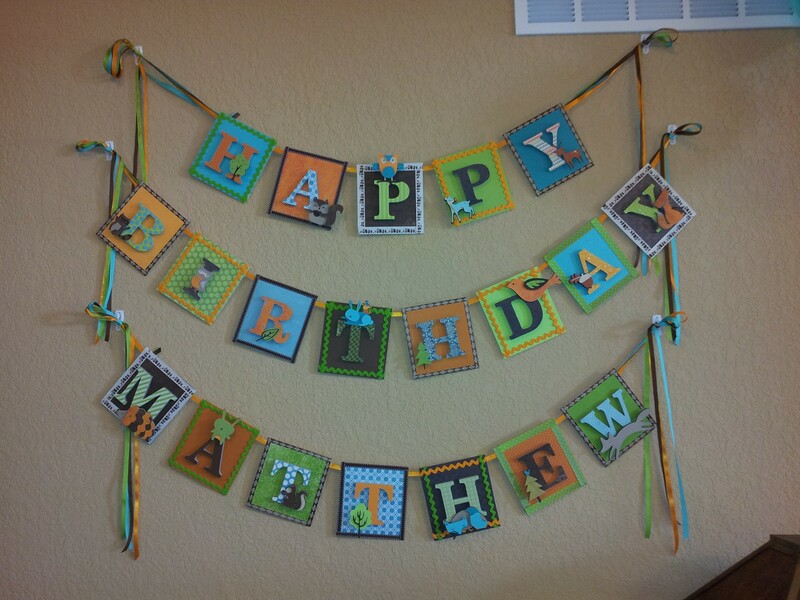 Categories: Birthday, Matthew, Wordless Wednesday | Permalink. I follow “Adventures in Infertilityland” and have for a very, very long time (years, maybe?). I love reading C’s perspective on things because she is so grounded and thoughtful, in my opinion. She is going through a rough time right now and she is one of those people who you just can’t help but throw your support behind because, well, she’s just darned likeable! So today, she posted the most poignant post I’ve read on any blog in a very, very long time. This just resonated with me and I have to share it. I think that it applies to any and all of us – no matter how big or small our struggles may be. Categories: Infertility, My Free Time | Permalink. The party went really well – I am pleased! I was disappointed that we weren’t better drink and food hosts – we left it as a, “serve yourself, feel free to get into our fridge,” kind of party (which isn’t like us), so that was frustrating, but that’s OK. I prefer to serve people drinks just because – hey – I invited you to a party and I want you to relax and have fun and let me do the work! BUT – there was too much to handle to be able to do that. B noted that for the next party, he wants to hire a bartender and I agree! We had some food, but we didn’t go overboard because the party was at 2:00 and we figured people would have eaten beforehand. We got our pulled pork started too late and I was of the mind that if it was ready in time, then great – but if it wasn’t, then we’d have it for dinner with my sisters (did I tell you that my sisters came from out-of-town? SO NICE! And when I say out-of-town, I mean out of STATE!). Well, it wasn’t ready and that did not stress me out one bit. We had homemade artichoke dip and guacamole (B makes the best guacamole), a fruit bowl (strawberries and pineapple because I hate melon), and cake. Oh, we had TONS of cake! The only cupcakes left after the party (besides a whole box in the fridge). I cannot tell you how much I loved those pom poms!!! There was a glitch that worked out in our favor. The bounce house guy never showed up. This actually pleased me because it was 90 degrees outside and there was no way that thing was going to get used in this heat! So I didn’t even call to ask where they were because I was supposed to pay them by cash or check, so I wasn’t out any money. YAY! And then? Our neighbors were here for the party and when I told them about the bounce house situation, they brought theirs over from their house and set it up in our basement. They have an in-home daycare (we tried to get Matthew in with them but they were full – and then I quit work anyway) and have the bounce house in a room in their daycare. They had it in our house and setup within 5 minutes. We owe them a major thank you! 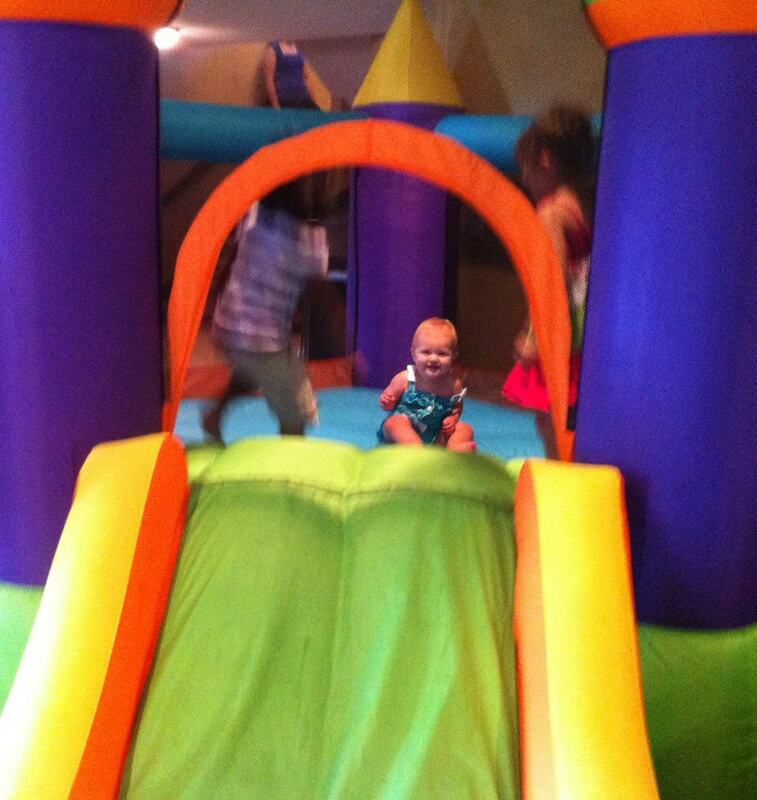 The bounce house was a HIT! Neighbors J and D save the day by bringing their awesomely HUGE bounce house to our basement for the kids! We had a ton of balloons and that made me very happy! I have no idea why I became so obsessed with having lots of balloons, but I did and they sure did make the house look festive! 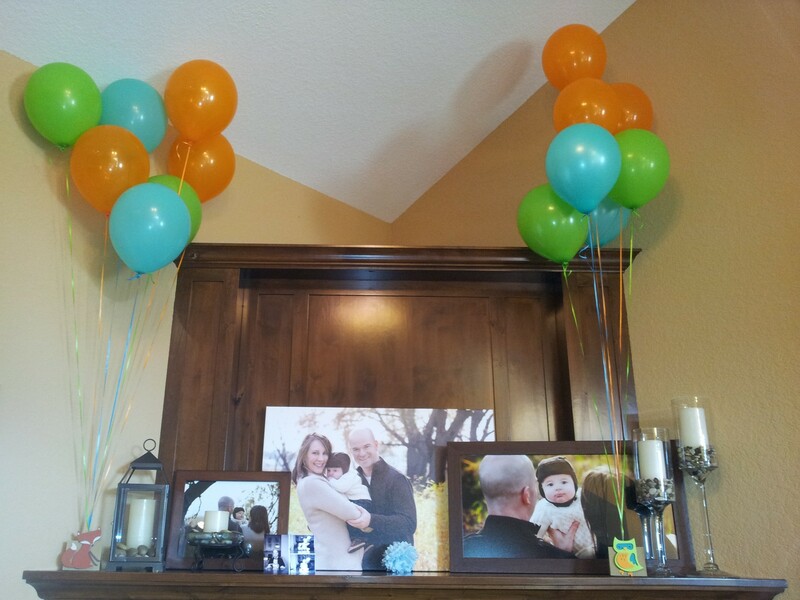 Two of the 5 balloon bouquets – with balloon weights that no one noticed. HA! The house was sweltering hot by the time everyone was here, and I kept telling people to go to the basement because it was much cooler down there, but only the kids and a few adults went down so the upstairs was packed! We made the mistake of forgetting to put Matthew’s big toys away (jumper that we don’t even use, hit two activity tables, and his ride-on truck) so the kids that were upstairs were huddled together taking turns with the toys. It was actually quite cute! Matthew LOVED having so many friends over. He was in heaven – absolute heaven. He didn’t get fussy even once (at least that I noticed) and he mingled with everyone throughout the whole party. Here I worried that we (I) were doing this all for ourselves but it really was one of his favorite days. He had his fun cousins here, his best friends, and countless adults to blow kisses at. I just can’t believe what a great sport he was through the whole party and then afterwards with our late guests (my sisters and nieces and nephew stayed with us – 6 overnight guests to play with!). He had no afternoon nap, so he slept very soundly! 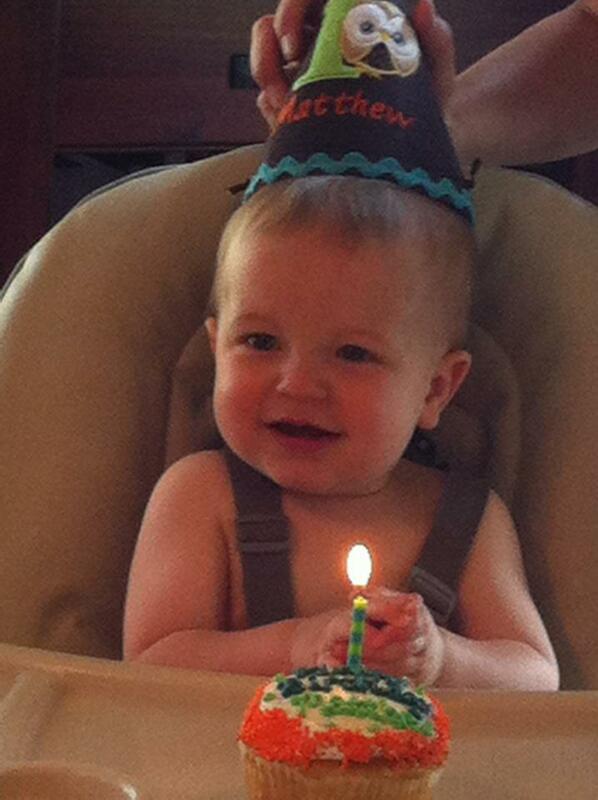 Matthew did not like the cake. He made a pretty good mess of himself with the frosting, but he spit the cake out faster than I’ve ever seen him spit anything out before. GOOD BOY! I am anxious to see the cake photos because he was super cute with it! His favorite part of the entire party (and this brings tears to my eyes) was when the entire house sang “happy birthday” to him. He applauded as we all sang and continued applauding until we were done singing. It was precious (and so memorable!)! We have way too many toys in this house now, thanks to our wonderful friends! Matthew was not into opening his presents but we had plenty of kids on hand to help out. B’s coworker’s son, who is 9 and crazy about Matthew (which is so fun to see from a 9 year-old boy), distributed his gifts to him, one at a time. Two of his most un-secret admirers opened his gifts for him and ooh-ed and aah-ed at his presents, trying to elicit excitement out of him. HA! They gave him kisses in-between gifts. 🙂 One of Matthew’s favorite girls recorded his gifts for me and I so appreciated that! I seriously loved every minute of it! I loved watching all of the kids rally around him to help him open gifts and celebrate! It was so special! I’m not sure that there is anything else to record – or at least until I get the photos which will surely jog my memory. I’ll end this post with what were the most memorable moments to me. Our very generous neighbors who saved the day! The entire house of 60 people singing “happy birthday” to my son! Categories: Birthday, Caking, FUN!, Matthew | Permalink. The house is picked up. And you, my boy, are no different today than you were yesterday. Thank goodness! You still snuggle with me. You still love to nurse. You would still rather sit in the shower with me than do practically anything else. You still blow kisses and wave hi and bye-bye. And you’re still my baby. 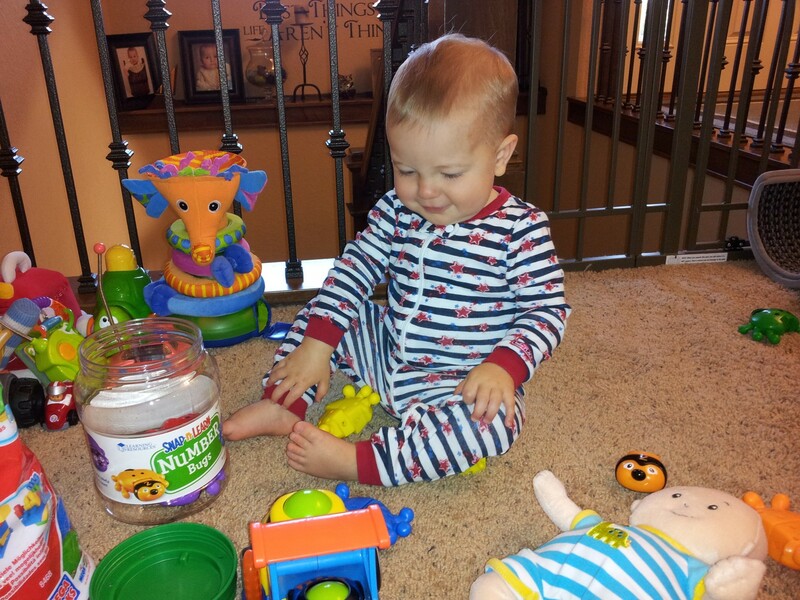 You’re not a toddler… yet! Your plethora of friends – you are the happiest, most social baby I have ever met (and I’m not just saying that because you’re MY baby!)! BOOKS! Oh my, you love, love, love books! Kissing everyone and many things (like favorite pictures in your books) with a big, wide, open mouth! Clapping! You clap for yourself, for Mommy and Daddy, for your friends at the gym… for EVERYONE! Everything you eat – you are the best eater ever! We get comments from people everywhere we go about what a great eater you are! Guacamole – I have to call this one out because it is your favorite! Yo!Baby yogurt. You pitched the biggest fit at the grocery store yesterday when I put it in the cart and didn’t feed it to you on the spot. HA! 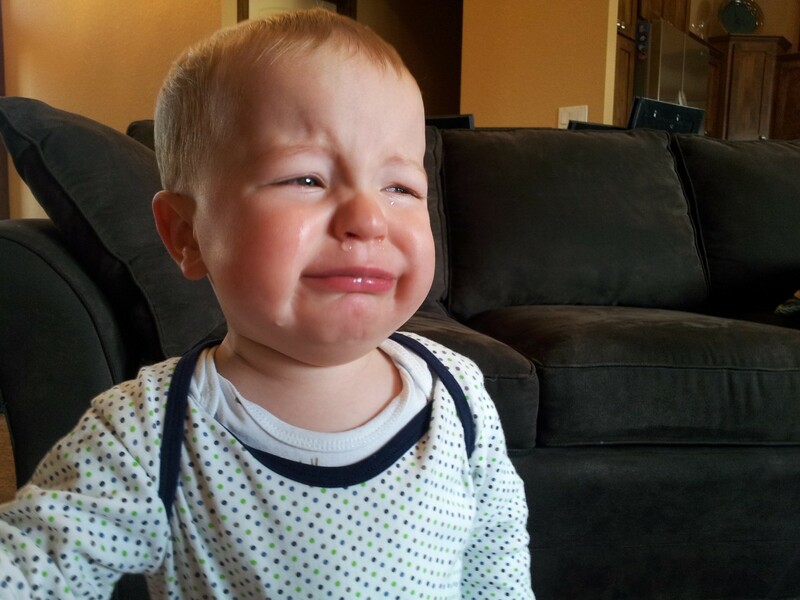 Being away from either Mommy or Daddy – but you get over it rather quickly because you’re so darned social! 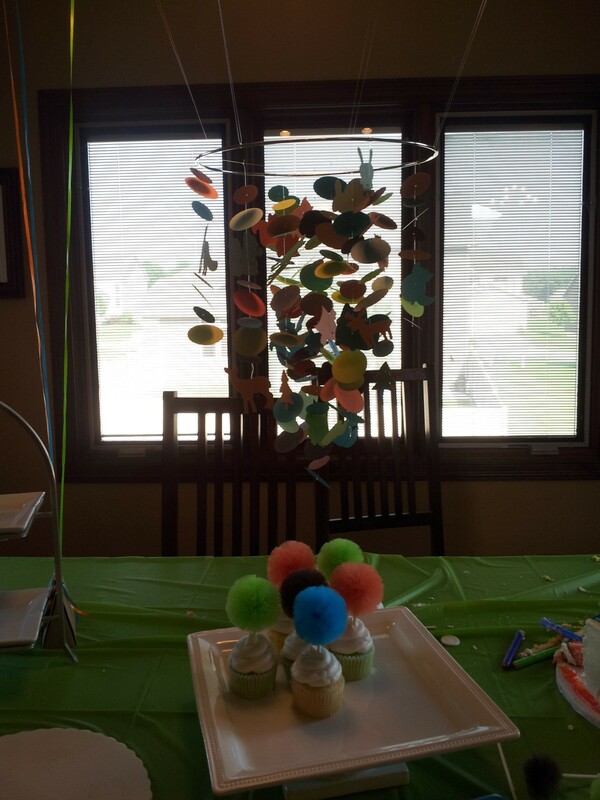 Your jumperoo – you do not like being contained! As you can see, sweet boy, you are so happy and you like most everything. I was hard-pressed to find things to put on the “Don’t like” list. You have brought so much joy and love to Daddy’s and my life – you have completed us 100%! We had spent 5 years together before you were born and though they were wonderful years (we had lots of fun and have so much to tell you! ), our best year has been the one we’ve shared with you. You are our best friend! As you know, we worked very hard to get you. It was a long road with years of tears and frustration (especially for Mommy). The minute we found out we were having YOU, all of that sadness went away and we’ve been nothing but happy ever since! We would go through those difficult times over and over again if it meant that we’d get you in the end each time. We both love you to the ends of the world and back again – and that will never, ever change. Happy birthday, my little bunny. I love you so much! Categories: Birthday, Matthew, THIS Moment in Time | Permalink.